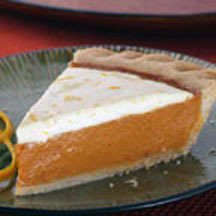 Pumpkin pie flavored with orange peel and a wonderful creamy sour cream topping is the perfect way to end a meal. Preheat oven to 425°F (220°C). If using frozen pie shell, place on baking sheet. Combine pumpkin pie mix, evaporated milk, eggs and 1 teaspoon orange peel in large bowl. Pour into pie shell. Bake for 15 minutes. Reduce oven temperature to 350°F (175°C). Bake for 50 to 60 minutes or until knife inserted near center comes out clean. Cool on wire rack for 10 minutes. Combine sour cream, sugar and remaining 1 1/2 teaspoons orange peel in medium bowl. Carefully spread over top of pie. Bake for an additional 8 minutes. Cool on wire rack for 1 hour. Refrigerate for 2 hours.